One of my favorite French television shows is Un dîner presque parfait. I get into it because it’s all about cooking – and trying to create an “almost perfect dinner.” In short, five amateur cooks take turns inviting each other over and making dinner. At the end of each episode (there’s one for every day of the work week), the contestants rate each other based on ambiance/table decor, entertainment and, of course, the meal. It airs around when one should start preparing dinner, and certainly helps set the mood for fun creativity in the kitchen. I’m usually inspired to start cooking up a storm and toy with the recipes I see the contestants tackling. The show’s fun because sometimes contestants’ attempts work, and sometimes they don’t. I guess we can all identify with that! 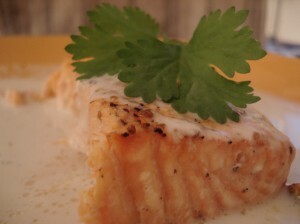 Once dish that particularly caught my attention recently was an appetizer of raw salmon served cold with a coconut-lime sauce. The young man who made it explained that the lime juice slightly cooked the salmon – no flame needed. I was intrigued, but I have to be honest – I shy away from raw fish, and thought, “How great would that be cooked?” I especially wanted to try cooking the ingredients because the other contestants, while they seemed to enjoy it, complained about the texture of the raw coconut milk. So, after going on a hunt through Paris for fresh salmon, ripe limes and additive-free coconut milk, I dove it. I experimented with this dish twice. First, I tried baking the fish and the sauce all together. Result: too much fish juice spread into the rest of my sauce and made it too watery, not punchy enough. Then, I tried baking the fish and making the sauce separately. This one worked! The simple combination of the three main ingredients (salmon, coconut and lime) is what made this sauce special. The exotic taste made me feel like I was elsewhere! 1. Bake the fish in the oven. First, prepare the receptacle by sprinkling some olive oil, salt and pepper on the bottom. Arrange the fish and sprinkle it with some more olive oil, salt, pepper and lemon juice. Place slices of the lime over the fish. Bake at about 375-400 degrees F (200 degrees C). 2. Make the sauce. In a saucepan, slowly heat the coconut milk. Then add the lime juice, salt and pepper. You should definitely taste the lime, and don’t be too shy with the salt and pepper. Let the sauce simmer lightly for 5-10 minutes and then let sit, covered, until the fish is ready. 3. To serve, pour the sauce over the fish, as well as some of the lime-oil-fish juice at the bottom of the baking receptacle. Sprinkle with a sprig of fresh coriander. This entry was posted in Recipes (All), Recipes (Gluten-free) and tagged fish, mains. Bookmark the permalink. Sounds good, but how long is the salmon supposed to bake in the oven? I never know how long to bake fish for! I just keep checking in on it, but start with about 15 minutes. I like salmon fully cooked on the inside (when the meat goes from dark to light pink). Don’t overcook it though or it will become dry.